We are instrumental in providing Terracotta Bells that are unique and are used as decorative items in homes. These Hanging Terracotta Bells exhibit traditional as well as contemporary designs that go well with lifestyle of our clients. The creative work of art that is carved on the bells is the testimony of our skilled artisans. 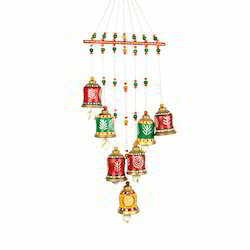 Hang this cute bell hanging in your living room or at the entrance to accentuate it's beauty. -The multicolour of the hanging not only gives a vibrant look but will add life to your house. 1. Terracotta handmade and hand painted. Acrylic colors painted attractive Terracotta Bell, a perfect show piece as well as a decorative stuff to hang on home entrance. Many interior designers like this product; it is your turn now. This decorative terracotta bell is washable also. 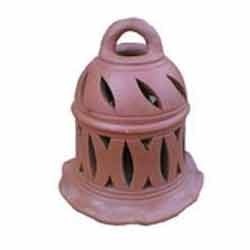 Our company has achieved widespread recognition in providing Terracotta Bell. Our organization is passionately engaged in offering an exclusive array of Terracotta Bell to the customers. These products are made from high quality components. We are remarkable enterprise, involved in offering superior quality Painted Terracotta Bell. Terracotta vintage design temple bell.